Aortic stenosis (AS) is defined as obstruction to blood flow from the left ventricle (LV) to the aorta (AO), whether at the aortic valve, or the subvalvular or the supravalvular level. Senile calcific AS is the most common cause in developed countries. It occurs in the form of a chronic inflammation, sclerosis & calcification of the aortic valve. The pathology is accelerated in the presence of one or more of the major risk factors for atherosclerotic disease, namely; diabetes mellitus, hypertension, Dyslipidemia and smoking. Male gender is another independent risk factor for this disease. If the aortic valve is bicuspid (a condition found in 1% of the population), the pathology tends to occur earlier in life than in a trileaflet aortic valve. About one third of bicuspid aortic valves will gradually get stenotic, usually in the fifth or sixth decade of life. Trileaflet aortic valve stenosis usually presents in the seventh or eighth decade of life. Rheumatic AS constitutes about 20% of all cases of AS in the developed countries, but is more common in the developing countries. Rheumatic AS usually becomes symptomatic in the fourth decade, and is associated with rheumatic mitral valve disease in most cases. Congenital AS usually becomes symptomatic in the first to third decades. It may occur at valvular, subvalvular, or supravalvular levels. Congenital valvular AS usually occurs in the form of a stenotic unicuspid aortic valve, or cusp fusion of a bicuspid aortic valve, without dense calcification, but often with extensive LV hypertrophy, and a high incidence of sudden cardiac death. Membranous subvalvular AS; caused by a subaortic membranous ring. Fibromuscular tunnel-shaped stenosis of the LV outflow tract. Hypertrophic Obstructive Cardio-Myopathy (HOCM): caused by muscular Asymmetric Septal Hypertrophy (ASH) of the basal part of the interventricular septum; which is more hypertrophied than the rest of the LV myocardium. HOCM also presents, however, in other forms such as concentric LV hypertrophy, or localized hypertrophy in regions other than the basal septum, e.g. the cardiac apex. Some authorities consider HOCM only under Cardiomyopathies, and do not include this disease as a variety of congenital AS. Supravalvular membranous ring in the ascending aorta. Tunnel-shaped stenosis of the aortic root. Hour-glass localized constriction in any part of the ascending aorta. Elfin facies: broad forehead, a short nose with a broad tip, full cheeks, and a wide mouth with full lips. Many affected people have dental problems such as small, widely spaced teeth. Sometimes associated with peripheral pulmonary arterial stenosis, hypoplasia of the aorta, and stenosis in renal, celiac, and superior mesenteric arteries. Intellectual disabilities and learning difficulties. Connective tissue and joint abnormalities. AS may follow mediastinal radiation; ≥20 years after therapy. Radiation may also affect the coronary arteries, pericardium, myocardium, lungs, esophagus, and thyroid gland. Even with severe AS; the patient may remain asymptomatic for a long period, during which progressive fibrosis, inflammation, and calcification occur. Once symptomatic, however, survival is dramatically reduced. Angina: about 35% of patients present with angina; 50% of them survive for only 5 years, unless treated. Syncope: about 15% of patients present with syncope; 50% of them survive for only 3 years, unless treated. Congestive heart failure (CHF): about 50% present with symptoms of CHF; their mean survival is <2 years, unless treated. Sudden cardiac death in asymptomatic patients is rare (occurs in about 0.5% per year), but dramatically increases to 2% per month after the development of symptoms. Moderate or severe aortic valve calcification. Rapid increase in the Doppler-derived aortic systolic gradient. Patients with AS have an increased risk of gastrointestinal bleeding, due to associated angiodysplasia, or arteriovenous malformations of the intestines (Heyde syndrome). Palpation of the carotid pulse is more accurate in the assessment of the severity of AS than the radial pulse. In severe AS; the carotid upstroke is reduced in amplitude and delayed in timing (pulsus parvus et tardus). Atherosclerotic stiffness of the carotid arteries in the elderly may, however, maintain a more brisk upstroke, thus underestimating the severity of AS. The apical impulse is not much displaced from the normal position (left fifth intercostal space in the mid clavicular line), and is heaving (forceful and sustained) in character. 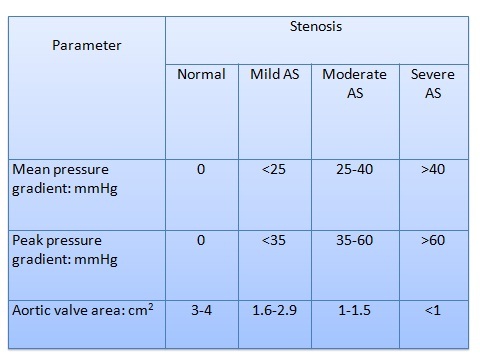 The aortic stenosis murmur is often associated with a systolic thrill at the aortic area. Aortic component of the second heart sound (A2) in moderate to severe acquired valvular AS is diminished in intensity due to reduced leaflet mobility. In congenital AS, even severe, A2 is usually normal because leaflet mobility is preserved. A fourth heart sound is common. Ejection systolic click usually precedes the AS murmur. The murmur of AS is a harsh blowing murmur, but lower in pitch than that of mitral regurgitation. Often loudest at the aortic area (the second right intercostal space near the sternum). Often radiates to the neck. Frequently well heard in the aortic area, then disappears over the sternum, and becomes louder again over the apex, thus mimicking coexisting mitral regurgitation (Gallivardin phenomenon). Early in the course of disease, the murmur typically peaks in early to mid systole, but peaks progressively later until it becomes loudest in the latter half of systole in severe AS. It becomes softer as the cardiac output decreases. Clinical manifestations of pulmonary arterial hypertension and right ventricular failure may occur in very advanced cases with LV failure. Conditions which reduce LV volume, e.g. Valsalva maneuver, will decrease the flow across the aortic valve, and reduce the intensity of the murmur of AS. On the other hand, these conditions worsen the obstruction in patients with HOCM, due to more contact between the anterior mitral leaflet and the hypertrophied interventricular septum, thus increasing the intensity of the murmur of HOCM. Aortic stenosis creates a pressure overload on the left ventricle, with increased LV systolic wall stress, which induces concentric LV hypertrophy (LVH), in a trial to generate more pressure, overcome the outflow obstruction, and normalize the wall stress (remember the Laplace equation; wall stress = PR/2H, where P: pressure, R: radius & H: wall thickness). Increased myocardium stiffness & reduced compliance. Diastolic LV dysfunction with impaired LV filling. Dissociation and complex modulation of the genes responsible for contraction and relaxation. Modulation of the Rennin-Angiotensin-Aldosterone System (RAAS)). Alteration of the myocardial matrix metalloproteinase activity and expression. Increased collagen deposition which further reduces muscle compliance. Development of symptoms particularly of subendocardial ischemia and arrhythmias, with worsening of the condition and finally a vicious circle is created. Reduced coronary flow reserve, from its normal 5-8 fold increase during stress above baseline, to 2-3 fold increase only, due to endocardial compression by increased LV pressure, and probably inadequate capillary growth. Outflow obstruction increases the systolic ejection time and reduces the diastolic perfusion time, thus reducing coronary filling. Meanwhile, myocardial oxygen demand is increased by increased LV systolic pressure and wall stress. Densification of microtubules comprising the myocardial cytoskeleton. Increased afterload eventually decreases contractile function and cardiac output, with frank LV systolic failure. Depressed contractility may be explained at least partially by impaired calcium handling and subendocardial ischemia. Inability to increase the cardiac output during exercise. Decreased blood pressure due to a vasodepressor response from increased intraventricular pressure. Supraventricular or ventricular arrhythmias may also precipitate hypotension. Both systolic and diastolic LV functions correlate strongly with the prognosis of patients with AS. ECG signs of LVH may be absent in patients with AS even though severe LVH exists. The cardiac shadow is usually normal in size, but may demonstrate manifestations of LV enlargement. Calcification in the aortic valve, particularly seen in the lateral view. Pulmonary venous congestion may occur later. Confirming the diagnosis of AS. Distinction between bicuspid and tricuspid anatomy. Thickened and calcified aortic valve leaflets. Calcification of the aortic annulus. The extent of concentric LVH. Calculation of LV ejection fraction (EF). Trans-thoracic parasternal short axis view showing bicuspid aortic valve. Aortic valve area. Diastolic dysfunction. Stress testing should be avoided in symptomatic patients with AS. It is particularly useful in asymptomatic patients to assess exercise tolerance, and when symptoms are uncertain. Dobutamine stress echocardiography (DSE) is especially useful in patients with AS who have a low gradient but a small aortic valve area (AVA) and a depressed LV systolic function. If the gradient does not change but the AVA rises >0.3 cm2, the myocardial impairment is the main issue, the valve is probably not severely stenotic (pseudo-stenosis), and AVR will be questionable. If the gradient increases, but the AVA remains small, severe AS probably exists, and AVR is probably useful. Nuclear imaging has been used to evaluate the presence of associated coronary artery disease. Aggressive management of atherosclerotic risk factors in patients with senile calcific AS. Medical control of congestive heart failure (CHF) might help. Medical control of angina might help. Antibiotic prophylaxis for infective endocarditis, whenever indicated. Vasodilators, e.g. ACE inhibitors, are relatively contraindicated, since they reduce the peripheral vascular resistance and thus increase the systolic pressure gradient across the aortic valve. BAV may be effective in patients with congenital AS. In adults with AS, however, the results have been disappointing, and as well 50% will get re-stenosis within 6 months. 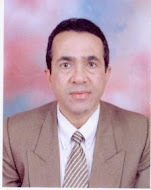 BAV has not reduced the high mortality seen in patients who do not undergo surgery for symptomatic AS. Accordingly, BAV is reserved for patients with AS and advanced CHF who are not candidates for surgery due to other co-morbid conditions and/or high perioperative mortality. Palliative BAV may be used in patients with treatable acute illnesses until resolution, to be followed by aortic valve replacement. AVR is performed through a median sternotomy incision, or a minimally invasive procedure with 8-10 cm incision in the lower sternum only, using a bioprosthetic or mechanical valve or a homograft. Replacement of the aortic valve as well as the aortic root may be performed, with re-implantation of the coronary arteries into the neo-aortic root. Another complex operation described by Ross is to excise the patient's own pulmonary valve and root & re-implant them into the aortic position. A pulmonary homograft is then implanted to replace the pulmonary valve and the main pulmonary artery. Significantly impaired LV systolic function. Deterioration of the prosthetic valve, with prosthetic dysfunction, particularly with tissue valves and after Ross operation. Prosthetic valve thrombosis and systemic thromboembolism. Infection; most seriously is prosthetic valve endocarditis.